I said last time that I would be working on a response to all the countless influences and occurrences here in Detroit. Well, here is how I am going to do it. The purpose of our nine weeks here in Detroit is... in fact I don't need to explain that, it's written in the box on the right: shrinkage, urban models, and all that. Make of that what you will. But what should all that mean for me personally? What sort of practical contribution should I be making to the debate? How am I to repay the investment Expodium has made in sending me here? These questions have been torturing me to an unreasonable degree during the last few weeks - and to some extent, ever since I got here, and even before. Jonas asked me something similar when we were in Chicago: what exactly is the point of foreign residencies, aside from the obvious gain in experience (and free travel) for the participating artist(s)? What do people living in the place visited have to gain from it? My answer at the time was that even simply being in contact with like-minded individuals from other countries is a benefit in itself. For example, I live these days in the Netherlands, despite that not being my home country. I am quite certain that I never would have even considered making the move there if I had not come into contact with a great many foreigners whilst living in Scotland. At the end of the day, I was tired of being the only native in a conversation; I wanted to be the exotic one. And life has gone pretty well since then. But it is not enough for me to simply be the quaint European on the block for a few months. I want to do something meaningful with the experiences I have undergone here, and do it before I go. Which gives me just three weeks. I have been thinking about what sort of form that would take. I have decided to produce another performance of a similar sort to the work that I have made in Utrecht, in the Museumkwartier last year and Kanaleneiland earlier this year. The free-form nature of such an outdoor event, which gives me the opportunity to give my very personal response to a number of things which have come to mind, seems well-suited to the environment here. Additionally, there are many interesting public spaces which would lend themselves well to such a piece. Of course, the problem lies in selecting and arranging the use of such spaces. And it is here that I have met with a lot of frustration recently. 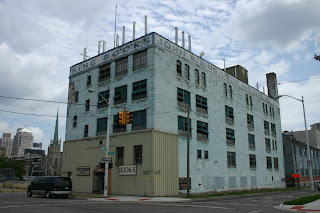 I really wanted to do something at the nearby General Motors plant, which lies on the border between Detroit and Hamtramck. However, trying to communicate effectively with such a large corporation has been an exercise in futility. After three weeks, numerous e-mails and phone calls, and a visit in person, I finally received a clear answer today: no, can't be done. I could expend yet more effort trying to reverse this, but objectively speaking, my energies can better be directed at other things. I have had slightly more success with another venue - the huge book warehouse of John K. King on West Lafayette Street. I sent them an e-mail yesterday, and today made a personal call at the store. The lady I spoke to was very friendly, said she'd read my mail, and would contact me at the beginning of next week. We'll see. In the meantime, I'm writing, writing, writing. It is slowly beginning to take on some sort of coherent form. With luck, the coming two weeks will be more fruitful than the last.